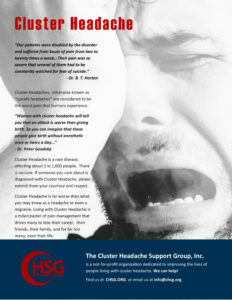 Check out the latest in cluster headache research! The purpose of the current study is to evaluate the efficacy and safety of TEV-48125 (Fremanezumab), in the prevention of CCH in adult patients. The Will Erwin Headache Research Center Study of Cluster Headache and Trigeminal Neuralgia is a prospective, multicenter, observational research network for subjects with Cluster Headache and/or Trigeminal Neuralgia.